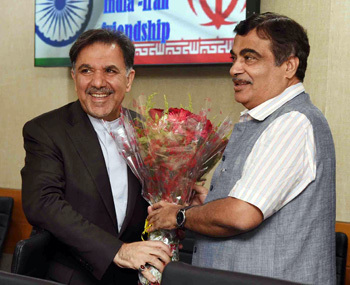 The Iranian Minister for Roads and Urban Development, Mr. Abbas Akhoundi meeting the Union Minister for Road Transport & Highways, Shipping and Water Resources, River Development & Ganga Rejuvenation, Shri Nitin Gadkari, in New Delhi on September 06, 2018. Concurrent to the Indo-US 2+2 Dialogue in Delhi on September 6, India was also hosting Iran’s Roads & Urban Development Minister Abbas Ahmad Akhoundi who held discussions with his Indian counterpart Nitin Gadkari, Minister for Road Transport & Highways, Shipping and Water Resources, River Development & Ganga Rejuvenation. Akhoundi later told media he and Gadkari discussed measures on India’s role in Chabahar Port, railway project connecting Chabahar Port, railway project connecting Chabahar Port with Zahedan, other railway and infrastructure projects that India is undertaking in Iran, adding, “India and Iran have the political goodwill that will help to overcome challenges created due to decision taken by the US. Ours is not an artificial relationship but a relationship that goes back in history. The US decision has no doubt created difficulties but Delhi and Tehran are finding ways to overcome this situation.” As per media reports, India had told the US before the 2+2 Dialogue it would not be able to reduce oil imports from Iran. The issue figured in the 2+2 Dialogue and there was ‘hint’ of US waiver with US Secretary of State Mike Pompeo telling US media later, “We have told the Indians consistently, as we have told every nation, that on November 4th the sanctions with respect to Iranian crude oil will be enforced, and that we will consider waivers where appropriate, but that it is our expectation that the purchases of Iranian crude oil will go to zero from every country, or sanctions will be imposed. So we’ll work with the Indians. We committed that we would do that. Many countries are in a place where they � it takes a little bit of time to unwind, and we’ll work with them, I am sure, to find an outcome that makes sense”, suggesting at the same time that US is ready to export oil in lieu of Iranian oil. The issue is not whether US oil is cheaper, costlier or same price compared to Iran, but Indo-Iranian relations and strategic importance of Chabahar to India. The trilateral engagement between India, Iran and Afghanistan during the visit of Prime Minister Narendra Modi to Iran in May 2016 expanded avenues of trade for India with Iran, Afghanistan, Central Asia and Russia through the International North South Transportation Corridor (INSTC). Chabahar port and the INSTC give India the strategic access for trade with Afghanistan and Eurasia, faced with denial of the land route through Pakistan. Iran plans to handover Chabahar to India for operation in a month from now but the US is not making any firm commitment about the waiver. On September 13, 2018, Alice Wells from US State Department told a Washington audience, “As we review the issue of Chabahar, it’ii be in the context of what it provides for the stabilization of Afghanistan or for or the kind of regional connectivity that serves other interests as well. But it is an ongoing process of review. Obviously, India is quite sensitive to price flutuations”, acknowledging that particularly in an election year; this is very important issue. But these are all pressure tactics and arm-twisting by the US; a country that looked the other way while Pakistan and North Korea develped nuclear weapons, invaded Iraq on pretext of lies stated officially to the US Senate that Iraq was developing nuclear weapons, and accusing Iran similarly while the IAEA found no evidence of the same. Wells statement that US is revieweing “how Chabahr can contribute to the stabilization of Afghanistan or for or the kind of regional connectivity that serves other interests” is laughable because one glance at the map leaves no scope for doubt. The Indo-US 2+2 Dialogue appears serving interests of the US more than that of India. The Communications Compatibility and Security Agreement (COMCASA) concluded during the 2+2 Dialogue allows India high-end encrypted communication and satellite data and import of critical technologies. The encrypted communication and satellite data implies whatever is detected by US warships or aircraft will instantly get transmitted to Indian Navy on secure encrypted receiver at Naval Headquarters. But there is no mention about intelligence sharing pertaining to land, and instant intelligence sharing. 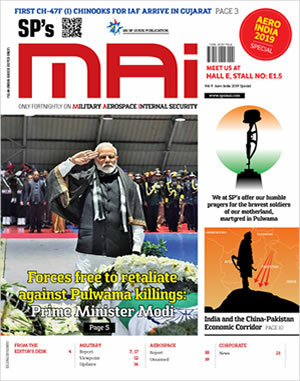 For India, the movement across and astride the Line of Control (LoC) and International Border (IB) with Pakistan and the Line of Actual Control (LAC) with China should be equally important, if not more, especially with India not having 24x7 satellite cover astride borders as China has. Why is this not part of COMCASA given the joint resolve in the 2+2 to counter terrorism � terrorist movements, launch pads, and the works. Such intelligence sharing is also relevant to areas like the Doklam Plateau in Bhutan and Chinese activities and buildup along the China-Pakistan Economic Corridor (CPEC), in addition to international borders with other countries. It should be imperative for the 2+2 dialogue and agreements signed to also cover Indian interests, not lopsided to cooperate only on high seas which is the primary US interest. Prior to the 2+2 Dialogue, Indian concerns about US sanctions on account of the Countering America’s Adversaries Through Sanction Act (CAATSA) with relation to India importing S-400 Triumf from Russia were also conveyed to the US side, but that waiver too is still awaited. In the exuberance to appease the US, the Indian Government doesn’t appear to realize that the US needs India as much strategically, as also for our markets and arms bazaar. We need to be equally proactive in bargaining. At the moment, US arm twisting appears working with Indian refiners reducing their intake of Iranian crude oil September and October by 12 million barrels each month, which is nearly half of what they imported earlier this year. Hopefully, we will not weaken Indo-Iranian relations because of mood swings of Donald Trump and commence operating Chabahar on schedule, with or without the US waiver.